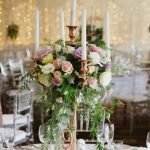 The old adage ‘Everything old is new again’ certainly seems to be true, with vintage style weddings becoming more and more popular. At Waterside Events, we know vintage, and we know how to make sure your vintage style wedding is full of old world glam. Choosing the right colours is the first step to creating a vintage themed wedding. A classic black and white theme always looks classy, a nod to the old black and white movies. A sepia tone is another timeless colour theme, think beautiful reddish browns. If that’s not your style then perhaps pale colours with whimsical names such as thistle, sage, fern, and lavender (pale green, yellow, grey, pink, mauve),will suit you better, not only do they look fabulously vintage, they sound it as well. Vintage decorations are essential to a vintage style wedding. Knowing what you want can be the easy part, knowing where to find it is sometimes a challenge. Op shops are often full of vintage treasures. You could stack some old suitcases on top of one another and place an old type writer on top which could act as a sign holder, with a message in typewriter font, (e.g. Introducing Mr & Mrs Newlywed). Timeworn books, cameras and chandeliers are also vintage gold. Perhaps a visit to your grandparents’ house could offer some inspiration. If you’re having a day time reception find some old trestle tables and dress them with white lace tablecloths and mismatched chairs. Antique tea trolleys, aged wooden crates and lamp posts would each set the scene and create a beautifully quaint entrance. Decorate the room with the fluffiest large petal flowers you can find, such as peonies, garden roses, dahlias or even daisies. If you’re having an evening vintage wedding, fairy lights will create the perfect ambiance you’re looking for. If you’re having a cocktail style reception where your guests are standing think small. If they have to use a knife and fork it’s a no go. Elaborately iced cupcakes are a must for dessert. If your guests are seated then anything goes. Waterside Events will work with you to create the perfect menu to suit your vintage style wedding. To really take your vintage style wedding up a notch have your guests dress in vintage clothes. For the ladies think long flowing dresses, ribbons, lace, pearls, faux fur shawls, sparkly brooches and parasols. For the men think white linen or cotton shirts, braces and vests, black, grey, or brown suits, and a vintage style hat. It will create a fantastic atmosphere and your guests will remember it for a very long time! When you’re planning your special day make sure you cut out pictures that you derive inspiration from and pin them onto a board so you don’t lose them. Pin all your ideas onto the board and then you can see what works together and what doesn’t. To find a team and a venue that can help you create a beautiful vintage style wedding, visit the staff at Waterside Events in Currumbin, where the dedicated function team are experts at throwing beautiful vintage style weddings. Contact us, today!.